Honestly, what would we do on this blog without those hilarious guys in Iran. In their latest standup routine, the Iranian Foreign Ministry Spokesman Ramin Mehmanparast issued a statement to the British government to show greater restraint in dealing with protesters in London and other cities. That’s right, the government that has killed, beaten, and raped protesters is publicly calling out England on its efforts to stop the rioting and looting in London. Mehmanparast called for an international investigation by human rights groups (which are largely banned from investigation in his own country) and suggested a “dialogue” with the protesters to avoid violence. We have previously seen the disconnect of Iran from reality in such statements. That includes officials investigating the influence of genies and hidden messages in Olympic symbols. That seems to fit nicely. Perhaps, Iraq is engaging in tongue-in-cheek rhetoric. Alina, if you could point to something good or useful about the Iranian government, perhaps we might be enlightened. Until then, they have managed to convince the world they are backward, ignorant, vindictive, duplicitous, and oppressive. To mention just a few of their better qualities. The United States is hypocritical as well. Our country also makes statements of peace, but we go off and destroy other countries, kill civilians, and displace innocents. All nations will behave in a hypocritical fashion. Why is Iran getting all the slack? 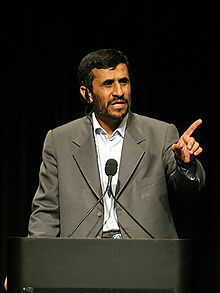 They are trying to do something good here, why must we always have negative things to say about the Iranian government? Food for thought. Great clip OS! GW did keep us laughing. Raff, we do have our home grown version. Who could forget these legendary moments in oratory. You are right about the Disney freak from North Korea! Raff, I dunno. He has a lot of competition in the batshit crazee department. There are a lot of throwbacks scattered around. North Korea’s “Dear Leader” comes to mind immediately. Then do not forget our very own Bush the Lesser. “Iammadinthehead” is one of the craziest world leaders in my lifetime. He reminds me of the Iraqi general in charge of publicity who kept telling the newspeople that the Iraqi military was squashing the Allies even while video was being played that showed just the opposite. I would have posted a comment earlier, but when I read this both my snark meter and irony meter went into overload and shorted out. If anyone ever wanted an example of the pot calling the kettle black, this is it. The current Iranian government proves, every time Ahmadlottaletters or one of his ministers makes a pronouncement, that reverse evolution is not only possible but exists today. One of the most horrible governments in the world attempting to lecture Britain on showing restraint. It must be insanity because no one in the Iranian government has demonstrated as highly refined a sense of irony it would take to make this statement otherwise. Sometime the insides of the pot is darker than the outside….